And the verdict in the Moerdijk disaster is in. Briefest of summaries: chemical packaging company burned down to the ground with 70 million euro's in property and environmental damages but not the employee that caused the fire but the managers were charged (deliberate arson no less) with the prosecutor demanding 2 to 4 years in jail. Luckily some sanity was restored today. The judges did not buy it. Three members of senior management are now sentenced to 180 to 240 hours of community service (NOS News). The prosecutor will appeal the verdict. Here is a quiz question from Billing & Brinker (DOI). What do you get when you react tetrahydrofuran in chloroform with 2 equivalents of tetrabromomethane and triphenylphosphine? Answer: 1,4-dibromobutane, tetrabromomethane, triphenylphosphine oxide and Ph3PCBr2. On the left the electron pushing to prove it. The reaction is similar to the Appel reaction and the Corey-Fuchs reaction but somehow chloroform itself does not take part in the reaction. Patience is called for in the published procedure: reaction time 10 days. A new recipe (Shen et al. DOI) for yet another physical manifestation of the carbon nanofiber. These nanofibers are usually produced from hydrocarbons with Chemical vapor deposition but the new recipe shows solid carbon sources are also useful. Take activated carbon, oxidise in sulfuric acid/nitric acid. Add solution to a solution of iron(III) chloride in ethanol. Stir. Heat carbon/catalyst mix at 1500°C. Slide under an electron microscopy. Observe bead in for a haircut. The central blob is described as eutectic C@Fe (ratio 1:1.63). From it the carbon nanofibers grow, diameter diminishing along the way and occasionally coalescing at the ends perhaps due to melting. The spheres can be removed in a HCl wash.
How does it form? The purpose of the initial oxidation is to create defects in the carbon lattice through oxygen-containing functional groups. The iron/carbon core is actually molten at the processing temperature of 1500°C. No nanofiber formation takes place below this temperature. The nanofiber growth is a liquid/solid process. Solid carbon dissolves into the Fe/C sphere, as the concentration of carbon increases it precipitates at the surface. The tip of each nanofiber is high in metal particles that are pushed out. The authors note that the crystallinity of the the fibers corresponds with the crystallinity of the carbon source material. This observation may not be in agreement with the formation model which relies on molten carbon. The Royal Netherlands Chemical Society has published a survey on wages earned in chemistry in the Netherlands. The wages are median and annual before taxes. Remember a Dutch Big Mac costs you 3.50 Euro, the average house costs 228K and the average tax rate is 40%. Top of the list are full professors (103K), then R&D managers (85K), production managers (77K), senior scientists (75K), sales managers (70K), associate professors (65K),senior R&D engineers (65K), teachers (59K), scientists (54K), process engineers (51K), associate scientists (48K), research analysts (42K) and then PhD students (36K). The data are hopelessly under reported. The society has over 8500 members but the survey was based on just 1000 members. The total number of employees in the Dutch chemical industry alone is estimated at 63,000. It is impossible to verify these wages. The number of chemistry related jobs advertised on the various job sites is tiny (< 10) and wages are not published. If there is any active recruitment in chemistry jobs, it takes place hidden from public view. The PhD student figure seems high. There is a thing called the Collective Labour Agreement for Dutch Universities so now the wages are public and known to the decimal: they start at 25K and end at 31K after 4 years. But not 36K. Teachers also seem to earn a lot of money. The data suggest that everyone from scientists to process engineers should quit what they are doing now (goodbye high-tech industry) and make the switch. Michelle Francl in Nature Chemistry is making a case for named reactions. It is interesting to read the habit of naming reaction is relatively new. Those long-dead nineteenth century Germans did not start the habit! It is also good to see Wikipedia cited for once. The article links to the List of Organic Reactions most of which are indeed named after contributing scientists. But why do chemists use named reactions? Francl mentions it is a way to honour discoverers, it teaches some history behind the invention to students and it makes it easier to find relevant literature. There are disadvantages: other discoveries by the discoverer are obscured and it makes it harder to study a particular field. Somehow systematic naming of chemical reactions has never made it. But is there another more scientific way to name reactions or rather protocols? In an ideal world the name of the protocol should always lead to the relevant publication. Naming the protocol to all contributing authors and not just of few would then be acceptable. And why not naming it after the journal. 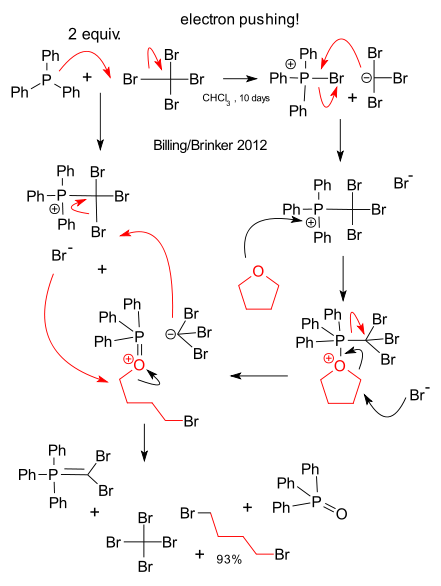 The Wittig reaction could also be known as alkylidene-de-oxo-bisubstitution (systematic, see March) or as the Wittig-Schollkopf reaction (use all authors even if it is just the assistant) or as the CHEMBER19541318 protocol.